We Want An Original Wedding! As modern marriage celebrants in South East Queensland, we find a lot of people are looking for a ceremony that really represents and reflects them. There is no greater expression of your love than to commit to be together for the rest of your lives so we encourage our couples to provide some information about their love story and of course select wording for the ceremony that they identify with. At Cherish Ceremonies we have an easy to use, extensive wedding ceremony manual that has content for all the different sections you might like to include in your wedding ceremony. You are not restricted by the wordings provided. There are a few paragraphs that are compulsory by Australian law, however, the majority of the ceremony is for you to include the wordings that best reflect you and your relationship. What Words Make Our Wedding Legal in Australia? “I am duly authorised by law to solemnise marriages according to law. Before you are joined in marriage in my presence and in the presence of these witnesses, I am to remind you of the solemn and binding nature of the relationship into which you are now about to enter. 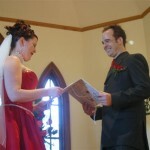 How to choose the right marriage celebrant for your wedding? 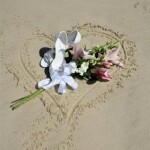 We often get asked what the difference is when it comes to celebrants, charges and inclusions. The fee of course completely depends on the celebrants experience, presentation, inclusions, equipment & professionalism. We know celebrants who charge over $1000 and others (very inexperienced) who crazily charge less than the registry office, but you must remember when it comes to celebrants you really get what you pay for. There are many celebrants, but not as many who are professional celebrants! Quite a lot of people have the qualification, but have very little experience and are really just celebrants as a hobby so they can perform ceremonies for friends and family. These celebrants do not have much experience and you can tell! Some charge extra for travel, themed dress, providing a PA, personalising the ceremony etc. 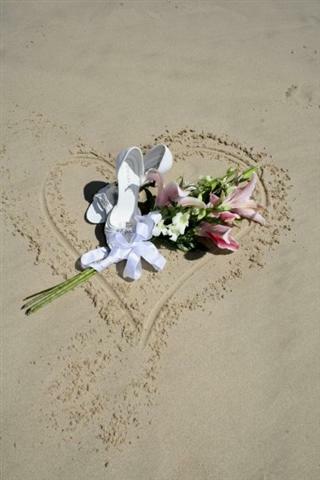 Your wedding is an important event in your life & your ceremony is a major part of it! Check out the celebrants experience, knowledge of the legal requirements, inclusions, how the ceremony is written, personalised & prepared, their presentation, the sound of their voice & a really important one, do you like them and feel really comfortable with them. We hope that helps! If you want to know anything else you should ask the celebrant for more information! All the best for the big day! Surprise, I still love you! In January 2013 I was given the honour and pleasure of performing a surprise Renewal of Vows ceremony! 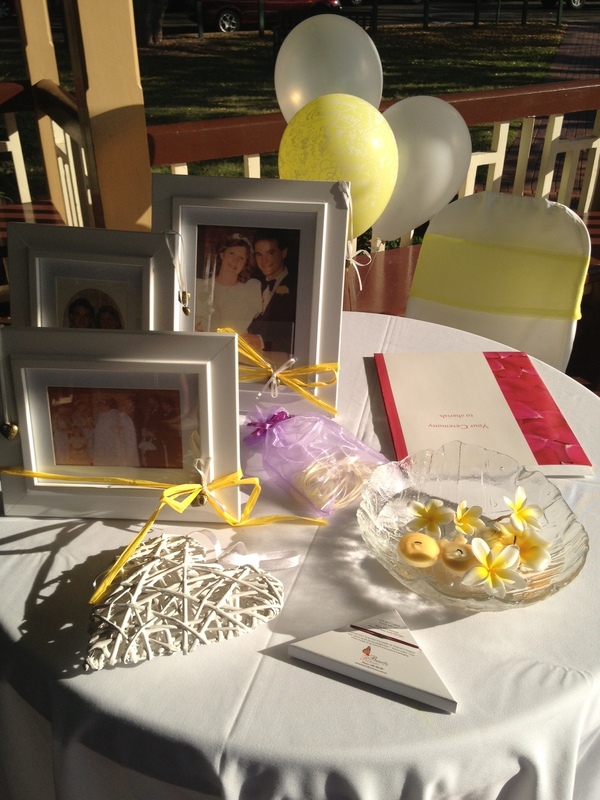 It was arranged by Sharon for her husband Bill for their 30th wedding anniversary! It was a small group of close family and friends who thought they were coming along for dinner to celebrate Sharon & Bill’s anniversary! Sometimes things just come together perfectly, as if they were always meant to be, and the ceremony was one of those special moments. Sharon was initially disappointed as she wished her 3 children could be there but one was overseas. On the morning of the surprise ceremony the son who had been overseas arrived back as a surprise to his parents! Sharon was able to arrange for the Best man, groomsmen and page boy from the wedding to be there for the Surprise Renewal and it was wonderful to get a photo of the original bridal party 30 years later!